The Aigyptos Foundation, in cooperation with the Slovak National Museum – Museum Betliar and with support of the Pro Oriente civic association, had the pleasure to host the IX. International Conference on Egypt (under the Khedives) and (Imperial) Austria. 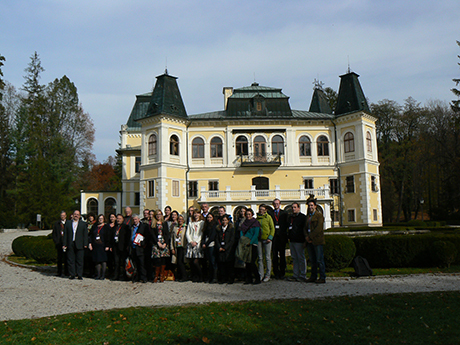 This prominent event took place in the Betliar Manor House from 21st to 24th October 2013. This year’s conference topic was ‘The Perception of Orient in Central Europe (1800–1918)’. More than 30 scholars from 8 countries delivered their presentations in the conference. Their contributions dwelt not only on the different perceptions of Egypt in Central Europe during the long 19th century, but also on the wider legacy of Egyptomania and Orientalism and their overhangs in the Mediterranean and in the Ottoman Empire. The conference was accompanied with a varied and lively cultural programme. Conference participants got a chance to get acquainted more closely with the culture and history of the Gemer Region of south-eastern Slovakia. Apart from the exposition in Betliar Manor House they were also able to enjoy visits in the Mausoleum of Krásna Hôrka, the gothic church in Štítnik and the historical centre of Rožňava and Košice. Particular insight into the culinary specialities of Gemer and the taste of vine from Sobrance-region Vineyards offered the Vine Cellars in hotel Čierny Orol.